景帝陵曰峻平，文帝陵曰崇陽，武帝陵曰峻陽，惠帝陵曰太陽: I wonder if the “names” were the names of the mountains they were buried on. Seems weird for the tombs to have names. It was standard practice for imperial tombs to have names, dating back to at least Western Han. For example Gaozu of Han's tomb was called Changling, Wu of Han's was Maoling (https://en.wikipedia.org/wiki/Maoling), Wen of Wei was Shouyangling, and so on. For the Western Han, calling the tomb for 陵 "Hill" was sort of justified, the Jin tombs were much more modest. Fornadan wrote: It was standard practice for imperial tombs to have names, dating back to at least Western Han. For example Gaozu of Han's tomb was called Changling, Wu of Han's was Maoling (https://en.wikipedia.org/wiki/Maoling), Wen of Wei was Shouyangling, and so on. For the Western Han, calling the tomb for 陵 "Hill" was sort of justified, the Jin tombs were much more modest. Thanks for that info! Yeah, I got sidelined by how they weren't literally hills. 蓋以幽州刺史鎭龍城也 = He was basically having the Inspector of Youzhou guard Longcheng. 襄堅壁不戰: This is a bit more active than what you have. 堅壁 = to strengthen walls (verb + object). So this may better be translated as “Yao Xiang dug in and refused to do battle”. 匈奴入居塞內者凡十九種 = There were 19 branches of Xiongnu who moved to live within the borders (塞內). 雖服大車，未經峻壁 = Although he has drawn great carriages, he has not be tested along sheer cliffs. 願試重載，乃知勳績 = But I am willing to try carrying a heavy burden, and by that you may see what I can achieve. 公嫌所載輕乎？= Do you consider your current load too light? 左右因以為奸，賞罰無准 = Because of that (因以), those around him committed villainous acts, doling out rewards and punishments wantonly. 誤犯而死者，不可勝數 = Those who accidentally violated that order and were executed were innumerable. 或剝人面皮，使之歌舞，臨觀以為樂 = Or he would flay the skin off people’s faces, and make them sing and dance before him as entertainment. 僕，刀鐶上人耳 = I am someone who’s already on the chopping block. 堅因婆樓以招猛 = Heeding Lu Polou’s advice, he asked Wang Meng to come see him. 語及時事，堅大悅 = when they spoke of current affairs, Fu Jian was greatly pleased. 時譽者，爲時人所稱美也。= The term時譽 means to be praised by one’s contemporaries. 或曰：刀以鋒刃爲用，刀鐶以上無所用之；婆樓以自喻。= Another explanation: a broadsword is useful because of the blade. The rings on it are useless, and Lu Polou was using them as a metaphor for his situation. 不世出者，言世間不常生此人。= The term 不世出 means that a man of this calibre is not often born into this world. 11. 昨夜三月並出 = Last night, three moons appeared at once. 撲殺之 = threw him to his death. 何不拜之！= Why do you not make obeisance to me? 何不速拜，不拜者斬之！= Make obeisance at once, or I will have you killed! 13. 它日有悔，失在諸君。= If anything regrettable come to pass, the blame is on you all. 14. Fu Jian’s brother Fu Rong was well-versed in studies: Sounds vague and redundant... (what exactly was he well-versed in?) Maybe “Fu Rong delighted in books” or “Fu Rong was well-read”? 史言堅有弟有子如此而無救於敗亡，明天之所棄，非人之所能支也 = The passage is saying, the fact that having such a brother and such a son did not save Fu Jian from his demise is a clear indication that Heaven had abandoned him, and it was beyond any mortal’s strength to stem it. 子孫存者皆隨才擢敘 = Their surviving sons and grandsons were promoted or placed in office according to their abilities. 22. 拜置征鎮，欲與燕、秦為敵國 = [Zhang Ping] appointed various generals of the Conquers or Guards ranks, intending to contest with Yan and Qin. 24. 堅與法訣於東堂，慟哭歐血 = Fu Jian and Fu Fa said goodbye to each other in the East Hall, crying bitterly to the point of spitting up blood. 25. 銅雀臺: I thought it’s always been translated as bronze, not copper. 27. 以文案不治，免左丞程卓官，以王猛代之。= Seeing how affairs were in disarray there (文案 = documents, case; 不治 = not dealt with (well); the sense here is the staff there were just sitting on the cases or doing them haphazardly, instead of doing proper work), he fired Cheng Zhuo and replaced him with Wang Meng. 恤困窮 = and cared for the poor and destitute. I feel pretty certain you can kill someone by whacking them with the sword ring, you're basically hitting someone with a metal rod. Fornadan wrote: I feel pretty certain you can kill someone by whacking them with the sword ring, you're basically hitting someone with a metal rod. I guess my question is whether these are rings lining the blade itself (which would be mobile and probably not very ergonomic for killing someone with, but that was the first interpretation I got), or if it's a solid ring at the end of the handle (which would fit the image I get with "築" a lot better). Either way it seems... inefficient, and yet HSX makes it sound like killing people with dao-rings was a fad or something during the Wei and Jin. 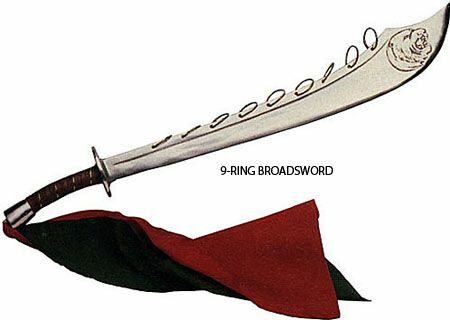 Was rings along the blade even ever a thing on military swords? I did a text search for 刀鐶 on ctext, and got 0 hits in the Sanguozhi, 2 hits in the Jinshu, 2 hits in the Weishu and 0 hits in the Songshu. [Li] Feng understood calamity had caught up [with him], and because of that indulged in evil words. The Emperor was angry, and sent fierce soldier[s] to use [their] sword rings to pound and kill him. It seems this is where HSX got his wording from. There really should be a description of Li Feng's death somewhere in the SGZ but I guess it is worded differently. Edit: I was too hasty with the SGZ, it seems Sun Hao also had people beaten to death with sword rings. Taishi: That was the kind of sword I was imagining too. Right, I had done a search on ctext too, but ended up being more confused then when I started, which was why I was hesitant in picking one particular interpretation. - Whatever it is, being hit this way is not necessarily/immediately fatal, since Yuan (Tuoba) Xie got hit a bunch of times and was still able to complain about his treatment, and at the end he even took poisoned wine to end his own life. - I find this morbidly comical. Sima Shi: "Gah, Li Feng pissed me off so much! Guards, go kill him! But don't beat him up with your bare hands or strangle him or mutilate him or slash his throat with your blades. Make sure you hit him with the rings on your blades and only that. Now go." - In this case it seems we're talking about a single fixed ring... I mean, it seems kinda awkward to try to hit someone in the armpit with the dangly rings on a long blade. Plus the whole spitting up blood due to internal trauma seems more consistent with being hit with a blunt object. - This one seems to suggest that the "rings on the blade", given that "身無完肌" ("he had no unbroken skin on his body"). If they had pummeled him with the solid ring fixed at the end of the hilt, I'd imagine the victim would show bruising all over, but no actual lacerations. This all is making me wonder if there are *two* kinds of blade-rings referenced. Do we have someone here on the forum trained in forensics? (LI) FENG would not tell him the truth. (SSU-MA) SHIH in anger struck him with the ring of his sword-hilt, killing him; he then sent the corpse to the t'ing-yü. Angered, the Generalissimo had a strong man strike him in the loin with the ring on his sword-hilt, killing him.